I recently finished most of the development of High Speed Zone (HSZ) act 5 and acts 1 & 2 of Antiquity Zone (AZ), for Socket the Hedgeduck, a mod ("hack") of Sonic 1 with Socket/Time Dominator levels/assets. 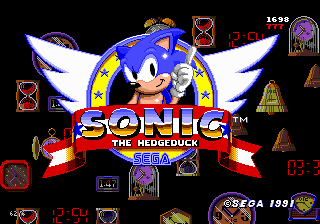 A v0.3 demo of the mod will be available as usual as a standalone IPS Patch, as a Steam Workshop item for the Sonic 1 DLC for the Sega MegaDrive & Genesis Classics collection, and also as an entry into the Sonic Hacking Contest 2016 before the contest deadline. Shown with the development video below are vertical speed booster subtypes for HSZ, a few custom platform subtypes for AZ, a torpedo enemy object for AZ, and other things. I am looking forward to finishing AZ3, ironing out the bugs, and polishing the hack for a v0.3 demo release (especially for the SHC16) online in October!